This story in this post proves two things: a) You never know what is going to happen when you get up in the morning, and b) If you are open to spontaneous adventure and not afraid to talk to strangers you can meet the most amazing people (and hear great stories). A friend who works at the Central Library told me about a talk by Beverly Tosh, an artist whose work celebrates the lives of War Brides, that was taking place on Saturday. The term "War Bride" refers to the approximately 48,000 young women who married Canadian servicemen during WWII. Most of these women came from Britain, but there were also those who came from the Netherlands, Belgium, France, Italy and Germany. The library had scheduled Tosh's presentation, and an exhibit of War Brides artifacts, in conjunction with the Canadian War Brides and Families 2014 Reunion, which was held here in London this weekend. About 10 years ago, I had photographed, and interviewed, a number of WWII veterans who resided at the Veteran's hospital here, and have always had a keen interest in stories from that time period. 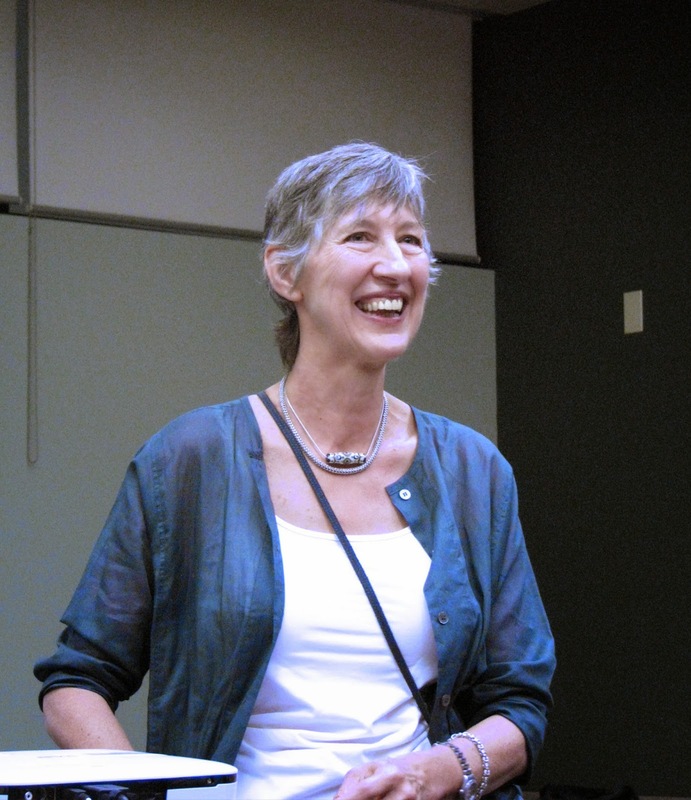 Tosh's passion for telling the stories of Canadian War Brides through her work shines through when she speaks about how she began the project and the women she has met along the way. 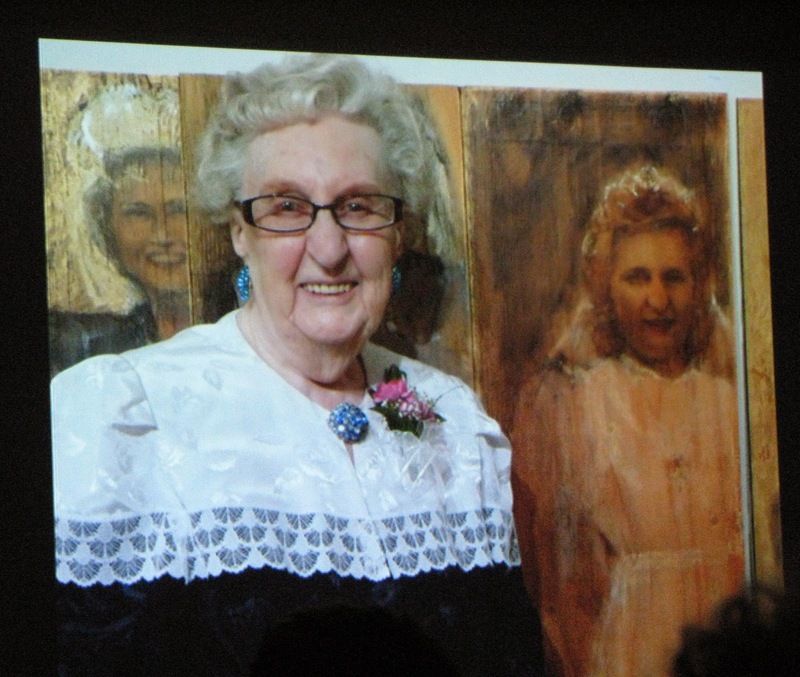 Tosh began her presentation with this slide, showing herself standing with the 8 ft portrait she had painted of her mother Dorothy, as a young war bride who emigrated from Canada to New Zealand to marry a pilot she met at a dance here in Canada in 1944. Tosh was born in New Zealand, but when she was nine, her mother left her husband and moved back home to Saskatoon, Saskatchewan. The painting's title, "One-Way Passage", refers to the fact that women who married servicemen received a one-way passage paid for by the military to their husband's homeland. Tosh showed slides of some of the photos that she has used in her work. Her source materials are the photos from albums belonging to the War Brides she has met and corresponded with. 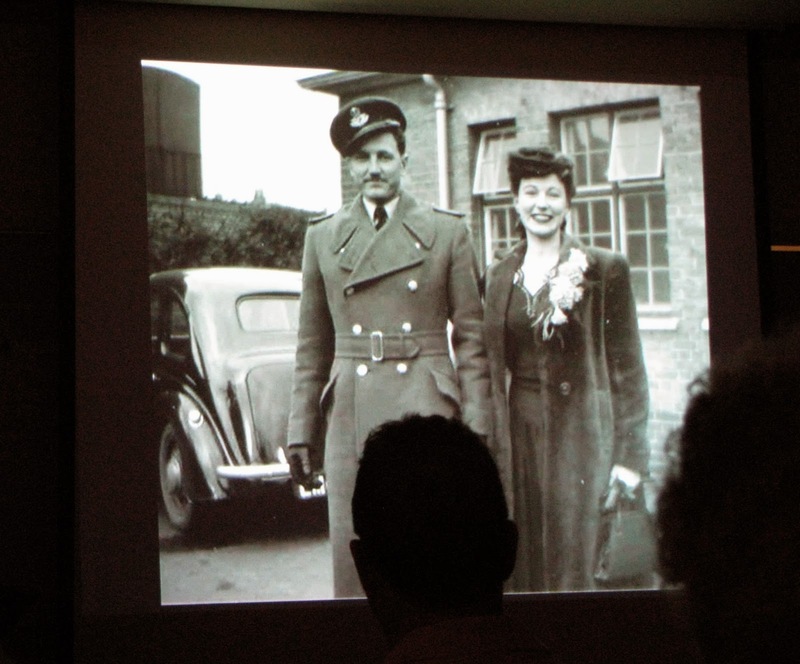 Hazel, the woman in the photo above, was a dancer, and is shown with the Canadian Serviceman she married. Unfortunately many of the women left comfortable homes in Europe and traveled in cramped conditions by boat (which were called bride ships) to a country they had never seen, only to find they would be living in a remote area with no electricity, running water, or easy access to supplies. Winnie, who arrived in Canada in 1946 as a widow with her two daughters, stands next to her portrait painted by Tosh. 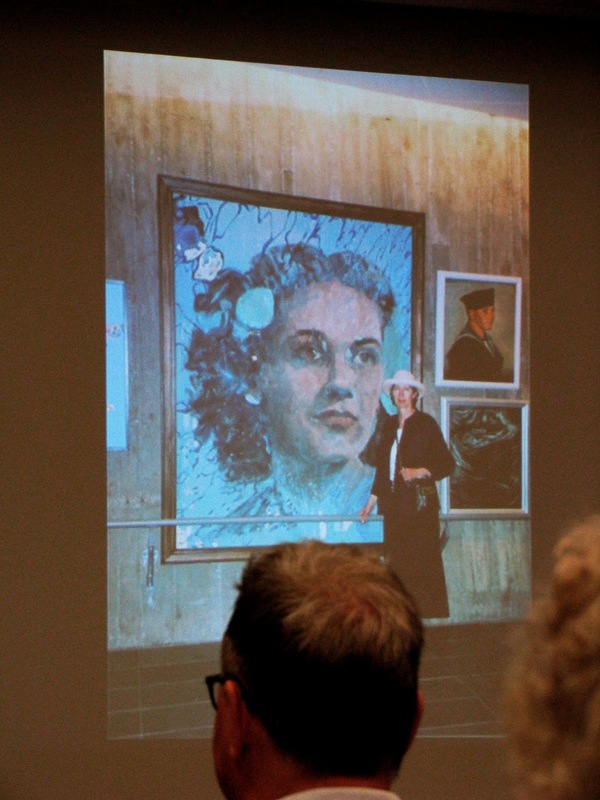 The Canadian War Museum in Ottawa held an exhibit of Tosh's War Bride portraits in 2008, and her work has since been exhibited in New Zealand, the Netherlands, Arizona, and most recently, Red Deer, Alberta. Tosh works in other mediums as well - this 10 ft long steel wire sculpture, called "Tug of War" depicts 15 Canadian women on the deck of their bride ship. 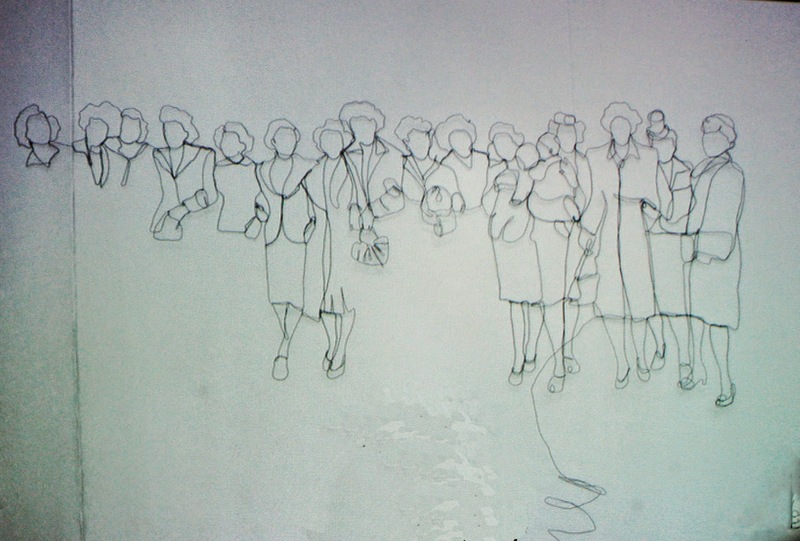 The work is made from one continuous length of wire, reflecting the connection between these women who didn't know each other, but had linked arms for their photograph. Tosh also creates "Tear Bottles" - small bottles filled with sea water, containing a photograph, and sealed with wax. The sea water represents the bride's ocean voyage, and her tears, and whenever possible, comes from the ocean that the bride crossed to reach her new home. You can find out more about Tosh's exhibit, War Brides: One Way Passage on her website here. 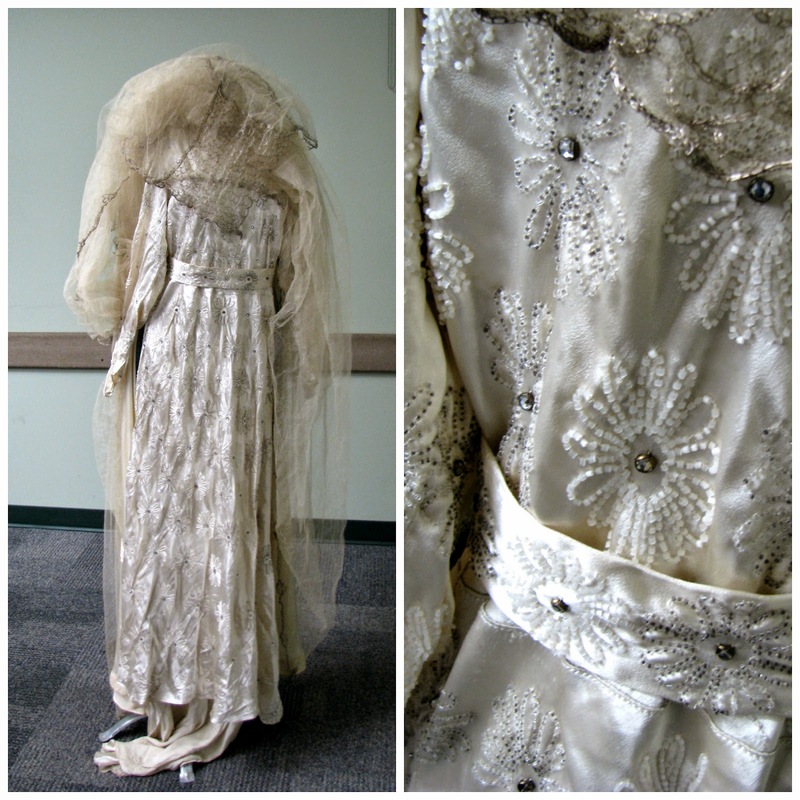 This wedding dress and veil belonged to Susan Wallace's mother, a War Bride, and is part of the exhibition of War Bride artifacts at the Central Library. Susan and her husband, local entertainment reporter/blogger James Reaney, Jr., attended the presentation and brought the dress with them. 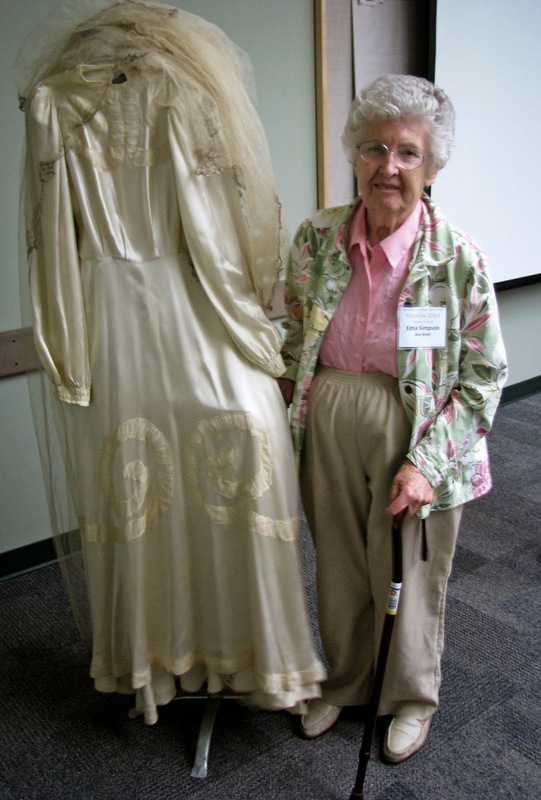 The other wedding dress on display belongs to Edna Simpson, in the photo above, who purchased it secondhand in England for 10 GBP. I sat next to Isabel Summers during the presentation, and she told me that she met her husband at a dance (the best place to meet servicemen), and on their first date, they went to see the film "Gone With the Wind". Isabel was coming down with a cold, and her husband-to-be went to a chemist's and got her some Vicks vapo-rub and cough drops, which made a good first impression. Unfortunately, they couldn't stay for the end of the film as they had to catch the last train home. She finally got to see the end of the film 25 years later. She and her husband were married 60 years. The majority of the War Brides I spoke with are now in their 80's or older, and their husbands are now deceased. 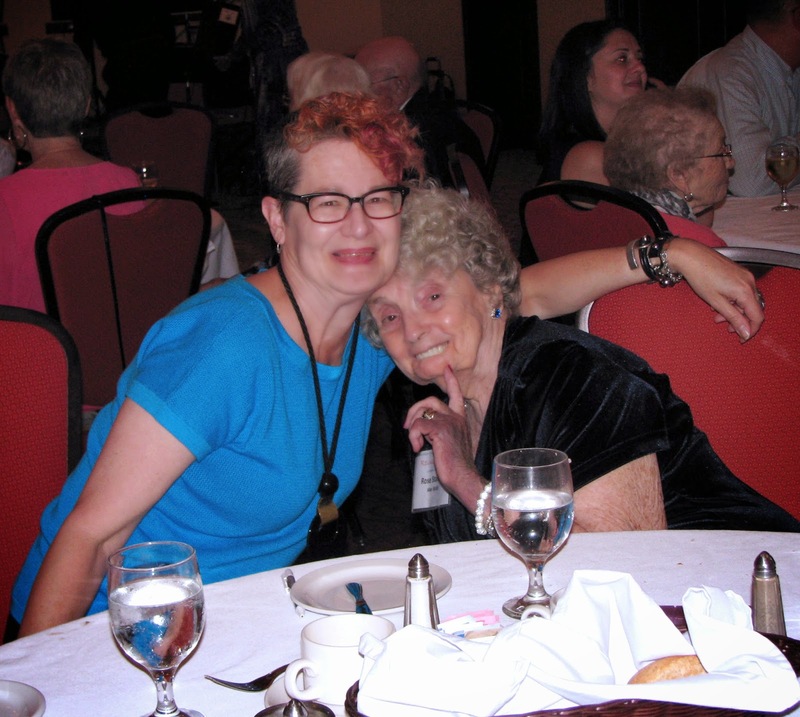 I met Dolores Hatch, who was assisting with the events that were part of The Canadian War Brides and Families Reunion, and voiced my desire to speak with some of the other War Brides, and she invited me to stop by the hotel where they were staying before the Saturday Reunion dinner. 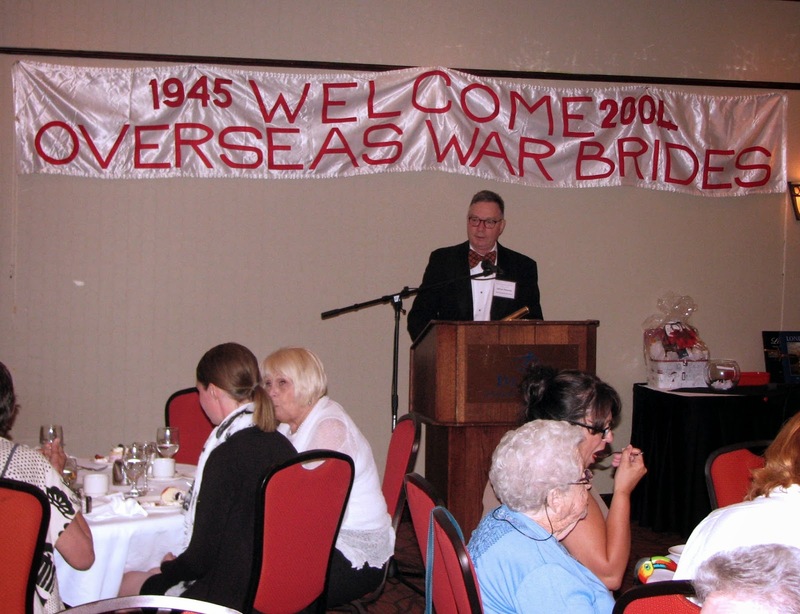 This was the fourth official reunion of Canadian War Brides and Families, and over 100 people had registered. 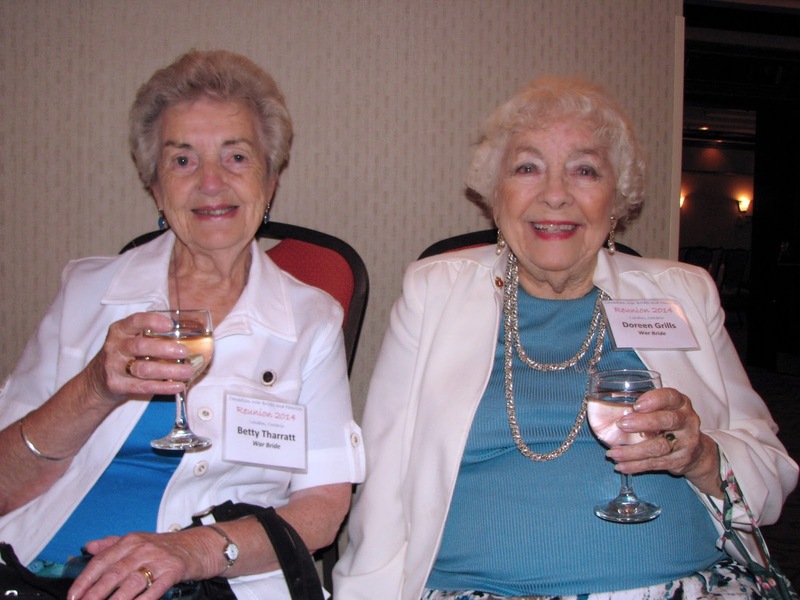 War Brides Betty Tharratt (left) and Doreen Grills (right) live here in London. In 2011 they sailed back to England on the Queen Mary II to visit their homeland. Many of the women were separated from their husbands for long periods of time when the husbands returned to Canada to find a home for themselves and their wife. Tharratt had to stay with her family in England, with her new baby, until her husband found a place for them to live in British Columbia. 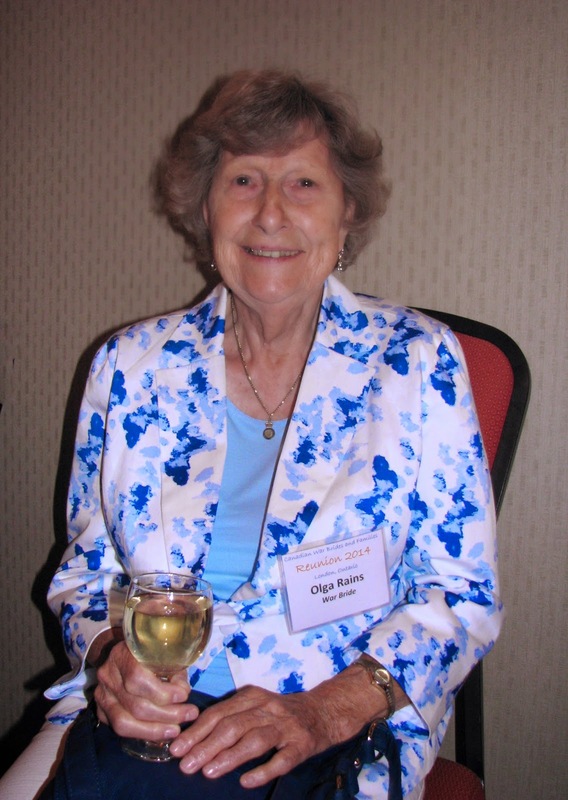 Olga Rains, who also lives in London, is a Dutch War Bride. 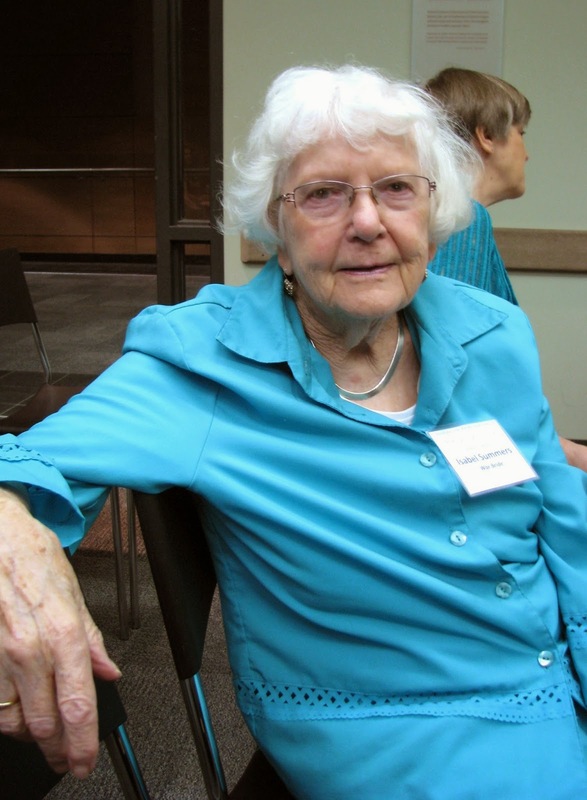 She had to wait in Holland for 9 months before she could join her husband, Lloyd, in Canada. After raising a family in Canada, the couple returned to Holland where they established Project Roots, which helped Dutch, British, and European war children connect with their Canadian fathers. 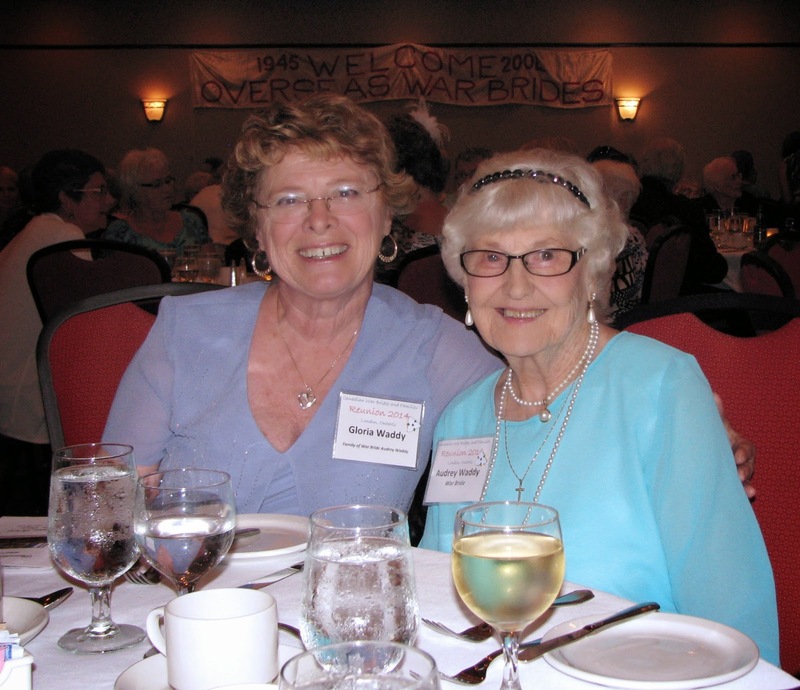 To my surprise, and delight, I was invited to join the War Brides and their families for dinner. I chose an empty space at one of the tables and set about meeting some of my dinner companions. Gloria Waddy and her mother-in-law, Audrey, sat across the table from me. Gloria's mother was also a War Bride, and both her father, and father-in-law, survived Dieppe. Her husband was in the Navy, and they share the same birth date - that's just too many coincidences in one family. I thought Audrey looked lovely in her turquoise outfit which had been made for her, and Gloria shared that her mother-in-law loves turquoise so much that she even carpeted her house in that colour. As someone whose living room was at one time pink, followed by pumpkin orange, I saw no problem with that. James Reaney Jr., decked out in a tuxedo and bow tie, was the emcee for the evening. My table mate immediately to my left was Rose Stanley, and it didn't take long for me to discover that she was a very funny, feisty woman. Now 87, she was born in London, England, and met her Canadian husband at a roller rink when she was only 16. She said that they both knew right away that they would get married, and by the time she was 17, they were husband and wife. They were married for 63 years, until his death, and according to Stanley, those years were "absolutely wonderful". It was incredibly moving to hear the enthusiasm in her voice when she talked about her husband, and how much they adored each other. Not all war brides were as lucky, and she knew of a few who were not treated well by the men they had travelled across an ocean to be with. 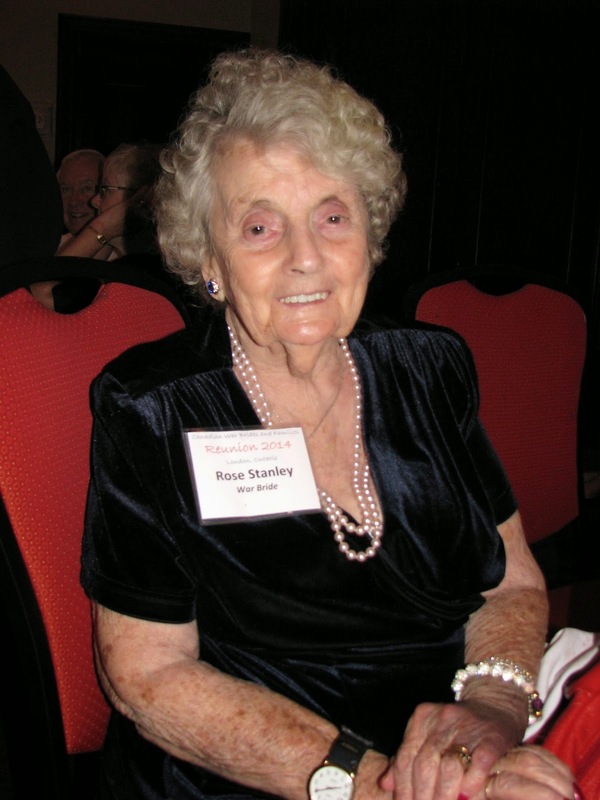 Rose and her husband were not well-off, and she did her cooking on a wood stove. She told me that the best gift she had ever been given was a hot plate. We discussed the challenges of cooking for one person, and of not driving a car (she had given up her license recently). By the time we finished dessert we were comfortable enough to pose for a silly photo. When the band started playing at 8 pm, it was time for me to head home. I told Rose that if she could find someone to send me an email, I would send her a copy of this photo. As I was leaving, I looked around the room and imagined all the stories these women had acquired during their lifetime, and wished that I could have spent a couple of hours with each of them. As it was, I was very grateful to have had the opportunity to meet some of them, and be given a tiny window into their lives. Their situation was one that will not be seen again (hopefully...) and their stories are a valuable part of Canada's history that should be recorded, and shared. Many thanks to Dolores Hatch for arranging my dinner invitation even though she had never met me before, and to James Reaney Jr. for confirming that I was not in fact, dangerous, or crazy. How bloody fascinating! Such wonderful and amazing stories, and yes, SO valuable! Funny how such beautiful love stories come out of something as nasty and evil as war. This is incredibly moving and totally interesting to me. I love that your positive appreciative energy was well received. You appreciate beauty and wisdom with age. This post speaks to your curiosity and ability to develop rapport with interesting people at the drop of a hat. I loved the stories told by these women and the wedding dresses are breathtaking. Thank you Shelley, for publishing a piece of Canada's history and bringing forth the lives of these vibrant women. Amazing post - that must have been so fascinating! Thanks, Shelley! What an interesting event, and how great to be invited along to dinner too! You are so good at meeting new people, Shelley; it's all about being a good listener and having a genuine interest and curiosity, I think. These women have amazing stories to tell, and personal histories are so important, it's good to know someone is listening and recording them. thanks for sharing this part of history that seems to be over looked. your new friends sure do have interesting lives. 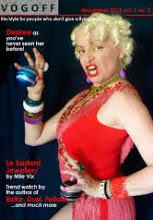 wonderful report and such interesting stories and lives, glad you've shared with us! I'm touched! 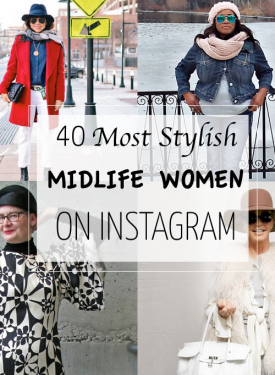 How fascinating and what a wonderful opportunity for you to spend time with these ladies. Shelley, it was a pleasure to meet you on Saturday and to have you join us for dinner. Thank you for your lovely photos and comments. The whole weekend was marvellous. It ended with enthusiastic plans to meet again in Calgary, Alberta next year. Details to be announced later. 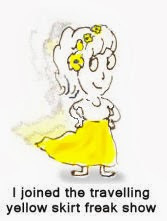 Canadian War Brides & Families can be reached at canadianwarbride@netidea.com. PS: Bev's exhibition is just ending in Red Deer, ALBERTA...not Saskatchewan as posted. shelley, thank you for your lovely comment and the welcome back. What an amazing experience! Too often stories such as these are lost. Kudos to Tosh for creating such a project, and to you for sharing these photos and life tales, and for having an awesome time to boot! This is such a great story! Sooo glad you covered it. Your delight in their company and their history is so evident. No doubt they enjoyed you as much as you enjoyed them. Fab, fab, fab! What an entertaining and touching post. Thank you for sharing.